Origins of HIV and AIDS pandemic traced to Democratic Republic of Congo. 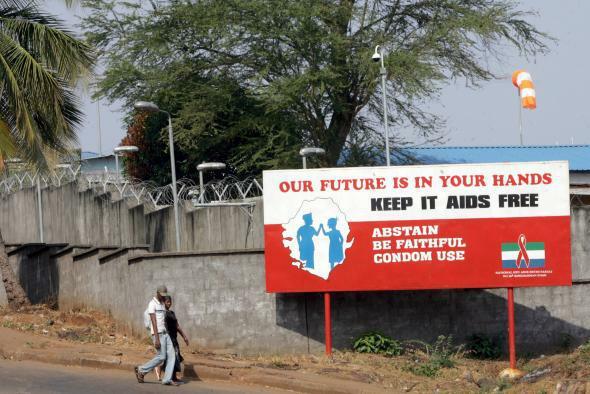 An anti-AIDS campaign poster in Sierra Leone. Three decades after the world witnessed HIV begin to take its devastating human toll, scientists have isolated where the pandemic started in Kinshasa, in what was then Zaire and now the Democratic Republic of Congo. The revelation is outlined in the journal Science, which dated the origin of the pandemic as early as the 1920s. “From the 1920s until 1960, the pandemic HIV strain – there were others that fizzled out – spread from Kinshasa, crossed borders to other nations, and ultimately landed on distant continents. It has infected nearly 75 million people worldwide to date,” according to the Guardian.